I made a big batch of English muffin pizzas on Sunday - enough to pack for one lunch, plus extra for another whole lunch and a snack or two. They are practically a perfect lunch food - easy to make, store and freeze great, and the perfect kid size. 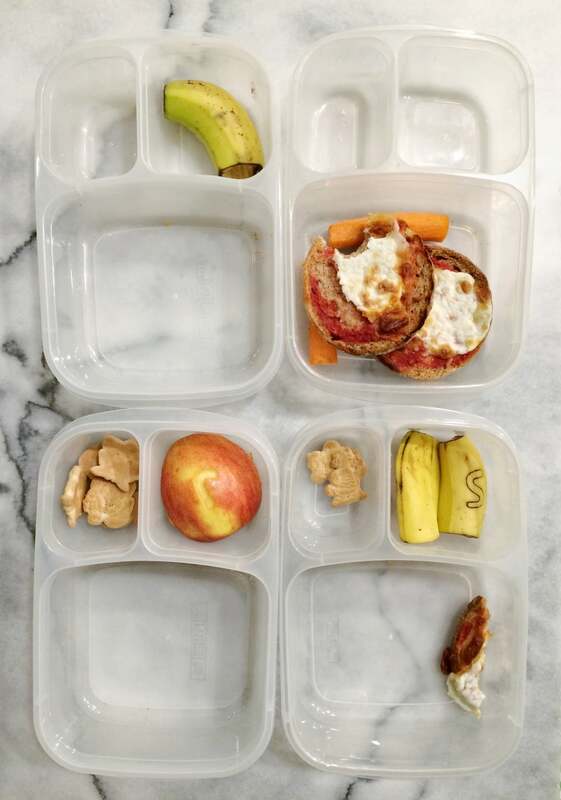 Having something like this made just makes lunch packing so quick and easy. These lunches took me just a few minutes - with the pizza already made, I just had to throw in a veggie and a fruit, and a little extra treat on the side. Done. For the pizzas - just split open english muffins, spread on a tablespoon or so of sauce, and top with the cheese of your choice. I use just plain tomato sauce, and these were just mozzarella cheese. Cook in the oven at 400 for about 12-15 minutes - until the cheese is bubbly and getting brown. Once cool, you can pack in lunch or put in a bag to freeze. And I snuck in one tiny peanut butter cup for a treat. These are eaten cold or at room temp. If I'm packing these from the freezer I just take them out the night before and put directly in the lunch box while frozen. They thaw in the fridge overnight and then are eaten at room temp at lunch time. For the initials in the fruits I just used a little mini cookie cutter. On the bananas I pressed it in just enough to make a mark. On the apples I pressed it through the skin, and then used a small knife to scrape the cut bit of skin off. It was all very quick. This was one of the more popular lunches I've packed in a while. Three kids ate almost every bite, and the fourth one actually finished most of his when he got home from school.